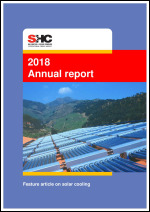 The following Annual Reports of the International Energy Agency Solar Heating and Cooling Programme are available online for reading. NOTE: Addresses of IEA SHC Operating Agents and Executive Committee members should be verified on the overall IEA SHC Member List to ensure the accuracy of the information. A hard copy of these reports can also be ordered from the IEA SHC Executive Secretary.